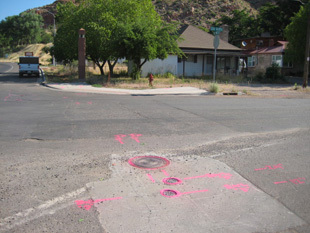 SUE Solutions successfully completed the Quality Level ‘B’ locating services for the SR-89; Main Street, Kanab project located in Kane County, Utah, for UDOT Region Four. SUE Solutions contracted with Civil Science to perform the utility investigation tasks on this project. The project is to include roadway reconstruction, shoulder widening, the addition of passing lanes and storm drain improvements. SUE Solution’s Scope of Work included Quality Level ‘B’ designating (horizontal) locating services. The QL-B designating services were completed in July of 2011. 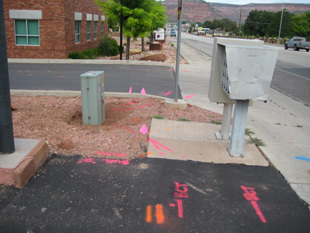 Approximately 5,700 feet of overhead utilities were located and mapped throughout the project corridor. Approximately 23,400 feet of Level ‘B’ designated utilities were located, surveyed, and mapped as part of the utility investigations. An additional 48,700 feet of utilities were mapped as QL-D, for a total of 72,100 feet of utilities mapped. Utility coordination efforts with existing utility owners, and local utility locating contractors also took place to account for those utilities that were not locatable by conventional means. SUE Solutions located utilities which included culinary and secondary water, phone, CATV, fiber optics, electrical, sewer and storm drain. SUE Solutions was able to locate these utilities ahead of schedule and under budget. The final deliverable to the design consultant consisted of a comprehensive final SUE report which contained existing utility conditions and their limitations, photographs of designated utilities, survey data, CAD files, survey files, and existing utility owner mapping.